UFC heavyweight champion Stipe Miocic didn’t get visibly upset when No. 1 contender Francis Ngannou was anointed as the next big thing in the division by many fans and media members, but it was clear in the UFC 220 main event Saturday that the Cleveland native had a chip on his shoulder at TD Garden in Boston, and he took it out on Ngannou as he won a shutout five-round decision over the knockout artist from Cameroon. “I’m not the scariest, but I’m the baddest,” said Miocic, who set a UFC record for most successful consecutive title defenses as he retained his title for the third time. Scores were 50-44 across the board. The two big men traded kicks to open the bout before Miocic looked for a takedown twice, with both coming up empty. After the second one, Ngannou began firing haymakers, putting the champion on the defensive before he found an opening to get a couple of his own shots off. With a little over three minutes left, Miocic clinched and bulled Ngannou into the fence, but the challenger got loose and went back to throwing at the head of Miocic, who did get a pair of right hands in before scoring a takedown with two minutes left. Miocic worked well from side control, landing some hard shots before the two stood. With under a minute remaining, both traded bombs before another takedown by Miocic as the horn sounded. Ngannou looked winded as round two began, as he wasn’t moving with the same speed he was in the previous frame. Miocic, who was bruised under the left eye, stayed patient, pecking away with kicks to the leg. Around two minutes in, Miocic drilled Ngannou with a flush right hand, and remarkably, the challenger remained upright. And while he was tired, his punches still had dynamite on them, leading Miocic to score another takedown. On the mat, Miocic leaned on his foe, tiring him out even more, and he threw in occasional knees and punches to keep referee Herb Dean from restarting the action. In the third round for the first time in his UFC career, Ngannou held off Miocic’s first takedown attempt of the frame, but after the subsequent clinch, Miocic put his opponent on the deck again. Ngannou got back to his feet, but Miocic kept mauling him against the fence before the two broke just before the midway point. 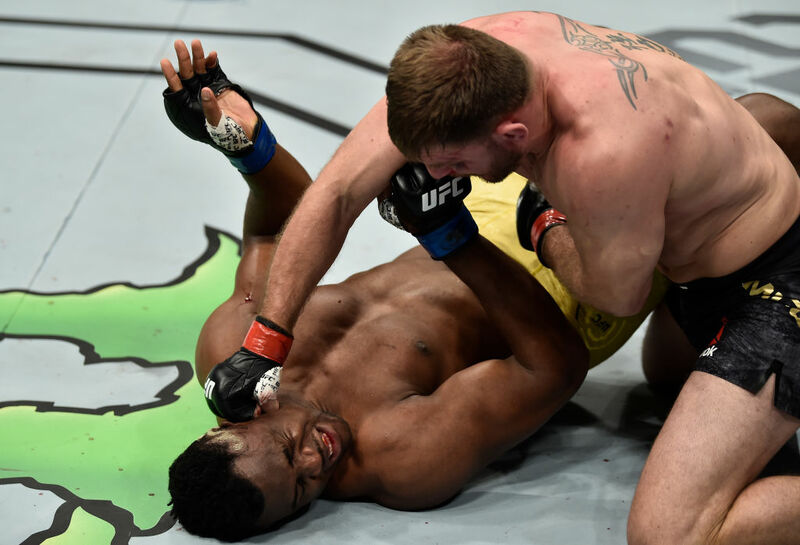 A right hand by Ngannou jarred Miocic, but the champion was able to score another takedown to clear his head. This time, Miocic got busier with his strikes, with Ngannou providing little in the way of defense as he remained grounded until round’s end. It only took 20 seconds for Miocic to ground the challenger in round four, and hard elbows to the body and punches to the face followed. Ngannou gamely tried to get up, but the champion wasn’t having it, and with under two minutes left, he let go with a series of unanswered left hands. Ngannou was still defending himself, but his offense was now nonexistent. Ngannou briefly got Miocic’s neck early in the fifth round, but he didn’t have enough strength to take advantage of the position, and after the action stalled in the clinch against the fence, Dean restarted the fight. Both fighters were clearly exhausted at this point, but there was still an element of danger each time hands were thrown, especially from the side of Ngannou. 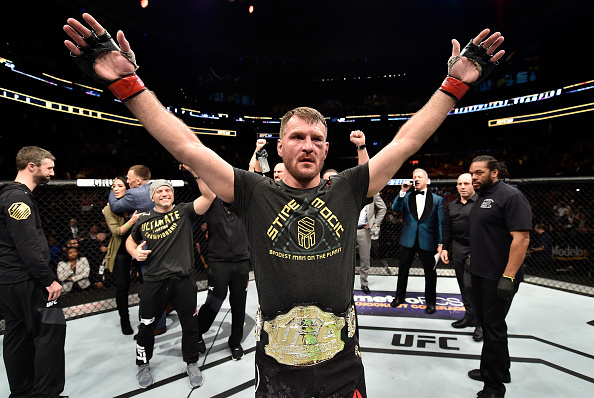 But when a flying knee attempt by Ngannou came up empty, Miocic clinched with his foe and ran out the clock, wrapping up a historic victory. With the win, the 35-year-old Miocic improves to 18-2. The 31-year-old Ngannou falls to 11-2.